Please join us if you’re in the San Francisco area! 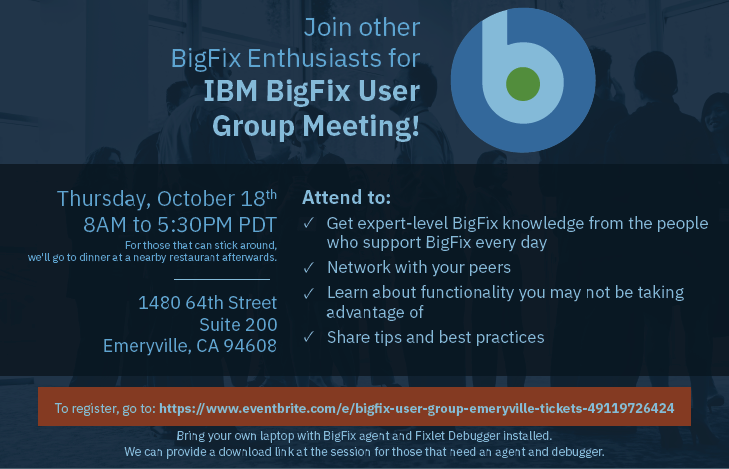 Master Class & User Group value, experiences, and upcoming events. I’m removing this data and moving it to the post above. Does anyone have any objections to me socializing this on my campus (UC Davis), at this point? please spread the word as much as possible everywhere you can!!! I’m excited to attend, present, and see many of you there! Hey all attendees! Like last year we’re going to have a small design session and I’m hoping everyone will be putting post-its on the wall. But if you can’t, or if you have a thought in the middle of a session you’d like to get out please use the survey we created and I’ll put them up for you. Here’s the survey. We’re asking you what would drive WebUI Adoption in your organization (or for you), what reporting tools you’d like to see integrations with, and how BigFix could be helpful in your cloud environment. It was great meeting new folks and reconnecting with familiar faces. Thanks to the planning group for finding room for me on the schedule. My slide deck is attached; let me know if anyone has questions.